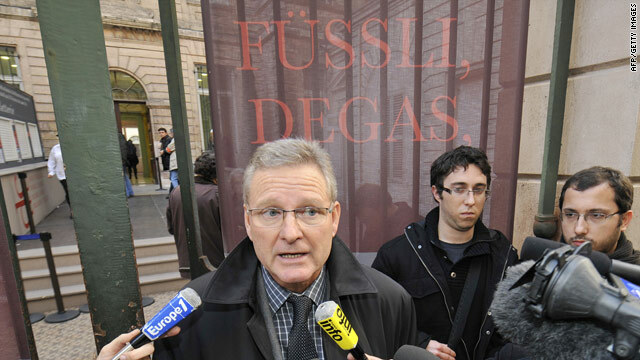 Marseille deputy mayor Daniel Hermann speaks to journalists in front of the entrance of Cantini Museum in Marseille. (CNN) -- French police were searching Friday for a Degas painting stolen from a Marseilles museum a day earlier. "Les Choristes," or "The Chorus," is worth about €800,000, or $1.15 million, Marseilles Police Commissioner Xavier Claudel told CNN. The 1877 pastel was on loan to the Musee Cantini from the Musee d'Orsay in Paris for an exhibition, Claudel said. It was discovered missing when staff opened the museum Thursday, he said. Investigators were going through surveillance camera footage for clues, but Claudel said he could not offer any more information about the case. Edgar Degas was a prominent member of the the Impressionists and produced a vast amount of artwork before his death in 1917 at age 83. His style, subject matter and artistic sensibility set him apart from his contemporaries, according to New York's Metropolitan Museum of Art.